It took me a while to finally post this photo. and do what I do best... TAKE PICTURES (Check out #StreetStylinwithTammy to view more). 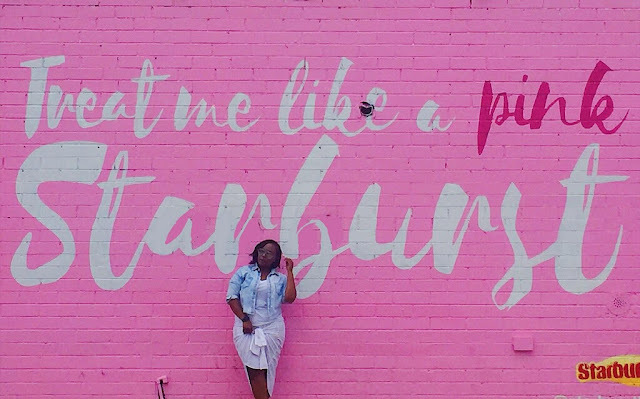 See this particular Mural, I've been lusting over it for a while. I knew it was in Brooklyn but finding someone to come with me to Brooklyn to take this picture would be hard. I checked The Bushwick Collective Instagram everyday to make sure the mural was still there and in GOOD shape and the NIGHT OF I check on it (via instagram explorer page) and it was all GOOD. Imagine me being all EXCITED to take this picture, finding the RIGHT outfit to match (because I usually scout out the location first before finding an outfit), getting a good night sleep, waking up EARLY to explore the Bushwick section of Brooklyn only to find out that the mural is... well you see it. 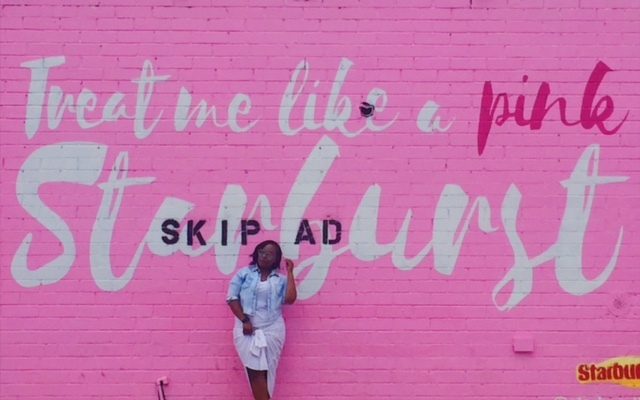 It's basically ruined with this "SKIP AD" painted in black over the Starburst word. I was STILL going to post this damn picture.. BUT with some concern that the message would get lost. And another thing... while we are ignoring the "Skip Ad" sign please CONTINUE to ignore the mess going on with my blog.. I am still working with someone to get it fixed but of course photobucket won't let me be great. *I almost forgot the GOOD part because I was too busy trying to keep y'all distracted by this ruined mural but check out how I styled my white oversized button-down shirt/ styled it as a skirt. Check out Plaid Print outfit Inspiration. **EDIT- I found someone who is a PRO at Photoshop to fix this picture.